Iâ€™ve been following, and a great fan of, Vick Audio for some years now and Iâ€™m always excited when new they release new pedals. The latest addition to their catalog is the 1861, a fuzz based on the early 90s Sovtek Big Muff. Hereâ€™s my review. Iâ€™ve told the story before but my very first Big Muff was a green Sovtek bubble font that I bought new around 1995-96. Thereâ€™s a never ending debate on which is better, the Civil War, the green tall font or bubble font? Iâ€™ve played them all but none has really come close to my old green tank. Perhaps itâ€™s nostalgia or affection but it really doesnâ€™t matter. Tone is subjective and based on personal preference. Iâ€™ve reviewed several pedals from Vick Audio over the years, including the â€™73 Ramâ€™s Head (which has often found its way to my stage board), the Overdriver and (one of my all time favourite overdrives) the Tree of Life. All of them done with great care and understanding of how the original pedals sounded like and what improvements needed to be done, without compromising tone. The 1861 is based on the early 90s Sovtek Big Muff, a.k.a. the Civil War (due to its blue and grey colours). This was one of the first Big Muff made by Electro Harmonix founder Mike Mathews after he moved to Russia. David Gilmour famously used a Civil War Big Muff during the recording of Divison Bell and on the 1994 tour, which was recorded for the PULSE live album and DVD. The pedal was once again added in late 2015 for the last leg of the Rattle That Lock tour. While those early 70s ramâ€™s head and triangle Muffs comes off as fairly bright and uncompressed, the early 90s Sovteks and the Vick Audio 1861 has a smooth and warm tone, with great sounding harmonics. With a moderate gain setting and the guitar volume rolled back slightly, you start to hear these subtle nuances and that fat, woody tone. The 1861 has plenty of sustain and despite the fairly high amount of gain and low end, the pedal has very little noise so itâ€™s easy to achieve those sustained notes without everything breaking into messy feedback and low frequency rumble. 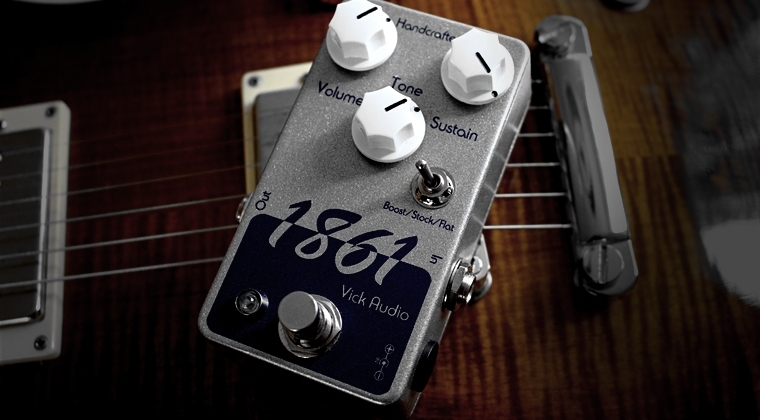 As with all of the Big Muffs from Vick Audio, the 1861 features the 3-way toggle switch for different mid range modes. Flat is the stock mode, with a slightly scooped curve. This brings out those sweet harmonics but you might find it a tad too thin on low output pickups. Flat equals a slight mid range boost compared to stock. Itâ€™s fairly moderate but enough to add a bit more smoothness and presence. Boost provides a noticeable mid range hump, with lots of presence and an overall smoother and fatter tone. This is excellent for bedroom setups and amps that has less mid range but be careful with this on amps like Marshall and Hiwatt and humbucker pickups, that already has a lot of mid range and compression. Where the 1861 surprised me the most was when I set the gain to about 9 oâ€™clock and the mid range switch to flat and used my Les Paul with P90s. I got a super fat overdrive tone, with an amazing sustain and these harmonics that responded incredibly well to my playing. The 1861 is perhaps not as huge sounding as some of the clones out there or the original models. But thatâ€™s not a negative thing in my opinion. Some of the Sovek models can be a bit hard to tame and the low end especially can be a bit overwhelming. The 1861 seems more balanced and again, itâ€™s easy to get some really nice overdrive tones on lower gain settings. My only (minor) concern is that there isnâ€™t a lot of volume available. You really need to crank it to reach unity or a slight boost. As most of my gain pedals are set up for a slight volume boost, I would have to pair the 1861 with a booster pedal or EQ to get the same result, which I think is a bit redundant. The pedal should be able to produce enough volume on its own. Still, the 1861 is an excellent addition to the already huge Big Muff family. The 3-way mid range switch and moderate gain, makes it ideal for achieving those huge fuzz tones on smaller amps and bedroom setups. Pair it up with a transparent booster and a loud tube amp and youâ€™re very close to David Gilmourâ€™s epic 1994 tones. Visit vickaudio.com for more details. Thanks for this review. I also have a few Vick pedals (73 and tol) but this one also interests me. Could you let me know a bit more about how it compares to the Vick 73? Does it sustain as well etc? The 1861 has slightly less gain and an overall less aggressive character. More lows and mids. I was kinda flerting with this Vick Audio’s pedal just because I love the Civil War version of Big Muff. It’s very nice to see it in action related to Gilmour tones! When compared to the Green Russian, the Civil War has more or less gain? That still confuses me… Kit Rae says that the CV version has lower gain than the GR… but sometimes I found the opposite comment online.. I know that there were very inconsistences when we talk about Big Muff construction, but you have the vintage one.. so, this 1861 has lower or higher gain? Cheers. I think it’s a general opinion that the CV and the early so-called tall font GR are more or less the same pedal. The bubble font GR is slightly different but you have to keep in mind too that the tone will change over the years as parts and electronics wear to some extent. Clones is a whole different story because they are often either clones of a specific pedal or, based on a schematic, with various alterations. The new reissue GR is a tad more top end or sparkle compared to my old Sovtek and perhaps slightly less gain but they’re very similar. The Vick has less low end and more mid range. Hi Bjorn! Is there a real, noticeable difference comparing the 1861 with the Vick Audio Black Russian? I haven’t tried the Black so I can’t really tell. Comparing the 1861 with a black Sovtek, I would say that the 1861 is smoother and a bit more open sounding. Hi Bjorn, how about of writing an article about home-recording? What camera, what microphones, what audio interface, what cables, what DAW, what plugin do you use in your personal studio to record your videos? I follow you from 2010. In the past years you have described in very accurate way every aspect of Gilmour tone (pedals, amp, pickups, guitars), but you have never talked about how record our Gilmour tone, either for understand our mistakes and improve our playing, either for share our performances on the internet. Many people spend years playing the guitar, but they are in trouble when they have to record their home performances. Can you give us any suggestion and explain your recording setup, perhaps with some photos? Thanks you very much and cheers from Italy. Hi Silvio! I get a lot of questions about recording and with David’s tones in mind especially. It’s definitely something I’ll look into. Thanks for the suggestion! Hey Bjorn, and my friends, I just got my beloved Rodriguez ’68 Strat clone back, and the Reeves, and every piece of gear will be back home by Monday! I had not seen my Cymbaline in over a year, and the friend I pawned her to, not being a musician, kept it safe, and never opened the case. As soon as I got it home, I opened the case, and it was still in tune, and no finger prints. He never opened the case, but stored it properly. The neck has not changed a millimeter! Peace from a happy man, KEITH! Yep, it is awesome, as long as I’ve been on this site, I’ve described, ( Ad Nauseum), about my gear, but have not posted anything to the Gallery. As soon as I can get my board set up again, I’ll send some photos. I’m no Stephen Ford,( guy’s got 3 or 4 incredible boards!!! ), But for a poor ex plumber, I’ve got one pretty nice board, and a couple of great amps, and 3 almost perfect Guitars! So I’m gonna quit talking about them, and show then off! So Bjorn Let me ask you a question. I own a few Vick Audio pedals, I’m a big fan of how the Overdriver pushes my Ram’s head. But my question is what is your favorite Vick pedal? Keep in mind it doesn’t have to be a Floyd inspired pedal. I just want to hear your thoughts on the matter. Vick is definitely one of my favourite brands. I use the 73 and Overdriver a lot but my favourite is the Tree of Life. I’ve always been a huge fan of the OCD but the Tree of Life has a bit more top end and a smoother break up. Lovely sounding pedal that sounds great nomatter what amp you use it with. I’ve given the Tree of Life some thought. I like what I hear on the You Tube Videos. I owned an OCD once. I bought it used and I could never get a good sound out of it. I finally( Last month ) took the back cover off and the previous owner had modified it! The board is burned, parts are missing others are added. I’m surprised it works at all. Thanks for the advice Bjorn, there’s a Tree of Life in my near future. Oh, that’s just too bad. Highly recommend the ToL! How does this compare to the Wampler Velvet Fuzz? I’m looking for a fuzz for the Meddle to Dark Side tones? Any recommendations? Im running a Laney Cub 12 with Weber Thames and a Strat with ssl1s in the neck/middle with a SSL5 in the bridge. For fuzz tones I would perhaps either get a fuzz or the Velvet. The 1861 is a Muff and although it doubles nicely as a fuzz, you’re probably better off with the Velvet as it’s easier to tame on smaller bedroom amps. You might also want to look into the MojoHand Iron Bell. After viewing your nice demo, I still can’t decide on which CW Big Muff to buy. I’m torn between the 1861, the Buffalo FX Patriot and the JHS Muffuletta. I own a Vick Audio 73 Ram’s Head, but I would like a CW Big Muf to nail David’s modern tones and PULSE in particular. Which one of the three I mentioned would you recommend? And would you recommend a TD-X or Overdriver/Power Booster as a booster for this Muff? My fav is the Buffalo but for the Lionheart I’m not sure. It can sound a bit too boomy and dark on that amp but it depends on your amp settings. The Vick is brighter and has less low end, which is easier to tame. The JHS is OK but I prefer the other two. Alexis! I have the same amp, Lionheart L5, and I’m in the same situation. I have the EHX Deluxe Big Muff, it’s OK, but it can sound really harsh and noisy. So i want so swap it. Iâ€™m in between the 1861 and the JHS Muffuletta. Let me know which one you bought!! BTW, I use a Boss Blues Driver (Kelly Mod) or BK Butler Tube Driver 5 Knob (with Ecc832 Gold Pins tube – remove the noise and harsh -) to boost the Muff. I finally chose the 1861 over the Muffuletta, because I already own the 73 Ram’s Head from Vick Audio. Knowing the quality of this one, and because of a lower price (and wanted an Overdriver for classic 70’s drive tones and boosting the Muff too), the Muffuletta was discarded. My goal wasn’t to swap my 73 RH but rather to have the missing piece for more recent DG tones. In fact, I finally had much more fun with the Overdriver than with the 1861! Awesome pedal, even for bedroom use, I was able to nail those Time/Money tones I was looking for. I will give it a try with a 18V power supply to hear the difference (assuming it will have more headroom than with 9V power supply). So in your case maybe you’ll be better with a Muffuletta, you’ll get both a 73 RH and a CW Big Muff type in only one pedal, and you’ll have no regret swapping your deluxe Big Muff. Be sure to also run your Big Muff with an independent power supply, in my own experience I had hard times dealing with noise because I was powering my gain pedals through a daisy chain. This builder is legit and makes fantastic clones. I own one of these and I do like it, but to be completely honest, and remember this is my own oh so humble opinion, I prefer his Ram’s Head. I would like to get a Vick Audio to compare to my Ron Sound Civil War just to see who wins. Would u recommend this of the ’73 for an all around bedroom pedal? Depends on the amp but the 1861 is warmer and smoother, which often goes better with low volume and smaller amps. The Princeton is one of the more mid rangy and compressed of the Fender amps, which is what a Muff and fuzz often need but it depends on what tones you want. Ideally, for David’s tones, I think I would go for something a bit more versatile like the Rat, OCD, Buffalo FX Evolution etc, which all has got more of that compression and mid range. Read more about choosing the right pedals for your amp here. Nice review! Mike is doing a great job with his pedals. I have the Ram’s Head and also noticed it doesn’t really boost the volume that much, so I have to crank it up a bit. Bjorn, do you or anyone else here, who owns the pedal, feel the same way about the Ram’s head? The ram’s head has more volume but it’s not the loudest Muff on the market. Glad to see this reviewed. I’ve played dozens of muff clones and I keep coming back to the Vick Audio. His muffs are no-frills but some of the best on the market. I’ve had the 1861 since it came out as a limited run as the Civil Muff early last year. I agree about the balanced tone. I found it to be less big sounding than most Sovteks, but also sweeter and with better sustain. In fact, if I wanted a Sovtek that could also handle the brighter early muff tones this would probably come closest of all of them I’ve played. Hello Bjorn…I was wondering what the best route would be (in terms of pedals) to replicate Davids howling guitar sound on Echos during the live Gdansk show in 2006. Thanks for any advice. What do you mean by howling? Which part of the song? What guitar, pedals and amp do you have? OK, David used a Big Muff and delay for that and I think the middle position on his Strat. The combination of the mids scooped Muff and the high delay settings makes up that sound. Keep in mind too that he plays VERY loud so you get a compressed tone from the amp, which makes the Muff sound smoother.